Old school water cooled VWs make fine beaters and respectable track cars. Weighing a boulimic 2000 pounds and possessing an easily upgraded suspension makes for a lot of fun. Although the trans-am cars had a healthy 170 horse power, the street cars made due with 78. That was enough horse power to reach 60 mph in a leisurely 12 seconds. Consider it more time to admire the plaid seating surfaces. The well proportioned good looks have aged well and it gets great fuel economy. 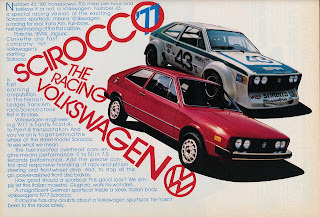 First gen Sciroccos are becoming increasingly rare, but only VW aficionados will realize you're not driving a Golf. You'll also need to become an expert in the finicky realm of Bosch CIS fuel injection but that's a small price to pay for a legitimate German classic from the Carter administration.